Below you find information about books and articles I've written, particularly useful links and a smattering of quotations about Wilderness. 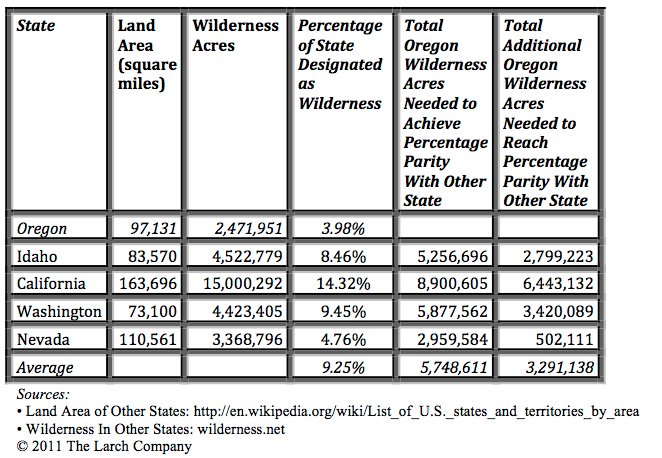 The table below (click here for a PDF) shows the acreages and percentages of congressionally protected Wilderness in Oregon and adjacent states. It’s rather embarrassing. California sure. Maybe Washington. But Nevada? Even Idaho!? The last column show how many acres of additional congressionally designated Wilderness Oregon needs to achieve parity with is neighbors. Fortunately, we have the wildland acres to do it, if we have the political will. I know just where they are (see books below). Oregon Desert Guide: 70 Hikes is, dare I say, the most definitive work to date on the unprotected wilderness of the dry part of Oregon, which is part of the Sagebrush Sea. Oregon Wild: Endangered Forest Wilderness is, dare I say, the most definitive work to date on the unprotected wilderness of Oregon's forests. • Persuading Congress to Establish a Wilderness and/or Wild & Scenic River: A Checklist (#1). National Wilderness Preservation System in Oregon details each area of congressionally protected Wilderness in Oregon, including acreage, location, date of enactment, etc. One of the greatest political challenges to the designation of additional Wilderness Areas is from the mountain biking community. The Spring 2003 Wild Earth, published a forum on Wilderness and mountain bikes that included articles on all sides of the issue. My article ("Which Way?) argued that wilderness advocates need to make limited accomodations for this non-motorized recreation use. Other commentators in the same issue have differing views. I suggest that the conservation community's inflexibility about mountain bikes in Wilderness is not serving our long-term political interests, let alone the protection of the wilderness resource. The link includes not only my article but related articles by distinguished conservationists Doug Scott, Dave Foreman, Brian O'Donnel and Michael Carrol, as well as piece by mountain bike and Wilderness enthusiast Jim Hasenauer. The Lesser of Two Evils is an article that I did for Wild Earth on recreation user fees on public lands. It argues for them, which is not the view of most conservationists. Grazing in the National Park and National Wilderness Preservation Systems co-authored with Mark Salvo of American Lands that appeared in Wild Earth. Congress Designates First Livestock-Free Wilderness Area (on Steens Mountain) appeared in Wild Earth. Last Stand for Oregon's Coast Range was about the little wilderness left this generally ignored portion of Oregon's forests and was published in Not Man Apart in 1980. Charge of the Wilderness Brigade is a parody I wrote around 1980 on the Oregon wilderness battle. Oregon conservationists owe a debt of gratidue to John Seiberling, who hailed from Ohio and chaired the House subcommittee with jursidiction over Wilderness in the late 1970s and early 1980s. Saint John took on Saint Mark (O. Hatfield) over Wilderness in the latter's state. There are areas in the Wilderness System today because Seiberling insisted over the objections of a state's senator. "Overlapping Wilderness and Wild and Scenic River Designations Provide Maximal Conservation Protection for Federal Public Lands" appeared in Environmental Law Online, a journal of the Lewis and Clark Law School. In 1978 I was an intern for the Oregon Student Public Interest Research Group (OSPIRG) where I evaluated the "Wilderness Review Program of the Bureau of Land Management in Oregon". Part One generally reviewed the nascent program and examines potential BLM Wilderness Areas in Western Oregon. The Oregon Islands, Table Rock and Soda Mountain areas are now in the Wilderness System today, and the Wild Roge is on its way. To determine roadless areas, one had to first determine what was a road. Part Two examined the initial BLM Wilderness review procedures, and interim management policies, and some initial inventories. Wilderness Shortage The best way to address this Oregon shortage is to increase the supply. Naming Wilderness After Hatfield is Wrong On his way out the door in 1996, Senator Hatfield's cronies renamed the Columbia Wilderness after the senator who has overseen the destruction of more of Oregon's wildlands and waters than anyone. The two premier Oregon conservation organizations that work for Wilderness designation are Oregon Wild (primarily forests) and Oregon Natural Desert Association (primarily forests). There are other regional and national conservation groups that are working diligently and effectively to designate areas as Wilderness. Great Old Broads for Wilderness (I'm a member) is great, young at heart, and absolutely for wilderness. wilderness.net is the best source I've found on the size, location, designation date and related matters for all areas in the National Wilderness Preservation System. It has links to the Arthur Carhart National Wilderness Training Center, Aldo Leopold Wilderness Research Institute and the International Journal of Wilderness. Is it worth one-quarter of 1 percent of our nation's timber supply or a fraction of a fraction of our oil and gas to protect 58.5 million acres of wild and unfragmented land in perpetuity? Such a policy would not subtract even a fraction of 1 percent from our economic wealth but would preserve a fraction of what has, since first the flight of years began, been wealth to the human spirit. What does Africa,—what does the West stand for? Is it not our own interior white on the chart? Black though it may proved, like the coast, when discovered. Is it the source of the Nile, or the Niger, or the Mississippi, or a Northwest Passage around the continent, that we would find? Are these problems which most concern mankind?... Be rather the Mungo Park, the Lewis and Clark and Frobisher, of your own streams and oceans; explore your own higher latitudes,—with shiploads of preserved meats to support you, if they be necessary; and pile the empty cans sky-high for a sign. Were preserved meats invented to preserve meat merely? Nay, be a Columbus to whole new continents and worlds within you, opening new channels, not of trade, but of thought. Our village life would stagnate if it were not for the unexplored forests and meadows which surround it. We need the tonic of wildness,—to wade sometimes in marshes where the bittern and the meadow-hen lurk, and hear the booming of the snipe; to smell the whispering sedge where only some wilder and more solitary fowl builds her nest, and the mink crawls with its belly close to the ground. At the same time that we are earnest to explore and learn all things, we require that all things be mysterious and unexplorable, that land and sea be infinitely wild, unsurveyed and unfathomable. We can never have enough of nature. We must be refreshed by the sight of inexhaustible vigor, vast and titanic ventures, the sea-coast with its wrecks, the wilderness with its living and its decaying trees, the thunder-clouds, and the rain which lasts three weeks and produces freshets. We need to witness our limits transgressed, and some life pasturing where we never wander. We are cheered when we observe the vulture feeding on the carrion which disgust and disheartens us, and deriving health and strength from the repast. The West of which I speak is but another name for the Wild; and what I have been preparing to say is, that in Wildness lies the preservation of the World. Once wilderness is mined or grazed or logged, it never can be true wilderness again. This should induce Americans to proceed slowly when they alter the character of their few remaining primitive realms because such a process inevitably becomes irreversible. Nature has done well by our United States. It is man's part that needs constant attention and improvement. Sen. Richard Neuberger, as quoted in "Guarding our Outdoor Heritage" in Neuberger, Richard. They Never Go Back to Pocatello: Selected Essays of Richard Neuberger, edited Steve Neal, Portland, Oregon Historical Society Press. pp. 66-67, 1988 (first appeared in Progressive , January 1959). An urgent need of the hour would seem to be, not more land to cultivate, but some change for the better in our ideas. There are educational uses in the mountains and the wilderness which might well justify a wise people in preserving and reserving them for such uses. Judge John B. Waldo, quoted in An Oregon Century: The Promise of Eden by Brian T. Meehan, Sunday Oregonian, Portland, Dec. 19, 1999, page A14. While the TV adds would have us believe that a four-wheel drive can take us to a wild place, it really can't. Wherever the engine takes us, real wildness will be just out of hearing over the next ridge. If we insist on driving into the wilderness, we're likely to destroy what we came to find. There's a land - oh, it beckons and beckons, And I want to go back - and I will. For there are some people who can live without wild things about them and the earth beneath their feet, and some who cannot. To those of us who, in a city, are always aware of the abused and abased earth below the pavement, walking on the grass, watching the flight of birds, or finding the first spring dandelion are the rights as old and unalienable as the rights of life, liberty and the pursuit of happiness. We belong to no cult. We are not Nature Lovers. We don't love nature any more than we love breathing. Nature is simply something indispensable, like air and light and water, that we accept as necessary to living, and the nearer we can get to it the happier we are. Live each day as you would climb a mountain. An occasional glance towards the summit puts the goal in mind. Many beautiful scenes can be observed from each new vantage point. Climb steadily, slowly, enjoy each passing moment; and the view from the summit will serve as a fitting climax to the journey. The only thing we know for sure about the future is that it will be radically different from the past. In face of this enormous uncertainty, the least we can do for future generations is to pass on as many of the planet's resources as possible. In God's wildness lies the hope of the world -- the great fresh, unblighted, unredeemed wilderness. Like most other things not apparently useful to man, it has few friends, and the blind question "Why was it made?' goes on and on, with never a guess that first of all it might have been made for itself. Climb the mountains and get their good tidings. Nature's peace will flow into you as sunshine flows into trees. The wind will blow their own freshness into you, and the storms their energy, while cares will drop off like autumn leaves. Thousands of tired, nerve-shaken, over-civilized people are beginning to find out that going to the mountains is going home: that wildness is a necessity; that mountain parks and reservations are useful not only as fountains of timber and irrigating rivers, but as fountains of life. For me, and for thousands with similar inclinations, the most important passion of life is the overpowering desire to escape periodically from the clutches of a mechanistic civilization. To us the enjoyment of solitude, complete independence, and the beauty of undefiled panoramas is absolutely essential to happiness. Wilderness is a continuous stretch of county preserved in its natural state, open to lawful hunting and fishing, big enough to absorb a two weeks' pack trip, and kept devoid of roads, artificial trails, cottages, or other works of man. The key to intelligent tinkering is to keep all the parts. Harmony with the land is like harmony with a friend. You cannot cherish his right hand and chop off his left. That is to say you cannot have game and hate predators. The land is one organism. Not to have known -- as most men have not -- either the mountain or the desert is not to have known one's self. Not to have known one's self is to have known no one. In the woods, too, a man casts off his years, as the snake his slough, and at what period soever of life is always a child. It is easy in the world to live after the world's opinions; it is easy in solitude to live after your own; but the great man is he who in the midst of the crowd keeps with perfect sweetness the independence of solitude. When all the dangerous cliffs are fenced off, all the trees that might fall on people are cut down, all of the insects that bite are poisoned... and all of the grizzlies are dead because they are occasionally dangerous, the wilderness will not be made safe. Rather, the safety will have destroyed the wilderness. Do not feed children on a maudlin sentimentalism or dogmatic religion; give them nature. Let their souls drink in all that is pure and sweet. Rear them, if possible, amid pleasant surroundings ... Let nature teach them the lessons of good and proper living, combined with an abundance of well-balanced nourishment. Those children will grow to be the best men and women. Put the best in them by contact with the best outside. They will absorb it as a plant absorbs the sunshine and the dew. Then love of wilderness is more than a hunger for what is always beyond reach; it is also an expression of loyalty to the earth ... the only home we shall ever know, the only paradise we ever need -- if only we had the eyes to see. A civilization which destroys what little remains of the wild, the spare, the original, is cutting itself off from its origins and betraying the principle of civilization itself. Wilderness to the American people is a spiritual necessity, an antidote to the high pressure of modern life, a means of regaining serenity and equilibrium. There may be some...like the earnest engineer, who believe without question that any and all forms of construction and development are intrinsic goods...who virtually identify quantity with quality and therefore assume that the greater the quantity of traffic, the higher the value received. There are some who frankly and boldly advocate the complete subjugation of nature to requirements of—not man—but industry. This is a courageous view, admirable in its simplicity and power, and all the weight of all modern history behind it. It is also quite insane. (T)he love of wilderness is more than a hunger for what is always beyond reach; it is also an expression of loyalty to the earth, the earth which bore us and sustains us, the only home we shall ever know, the only paradise we ever need—if we only had eyes to see. Original sin, the true original sin, is the blind destruction for the sake of greed of this natural paradise which lies all around us—if only we were worthy of it. A man could be a lover of wilderness without ever in his lifetime leaving the boundaries of asphalt, powerlines, and right-angled surfaces. We need wilderness whether or not we ever set foot in it. We need a refuge even though we may never need to go there. I may never in my life get to Alaska, for example, but I am grateful that it is there. We need the possibility of escape as surely as we need hope; without it the life of the cities would drive all men into crime or drugs or psychoanalysis. It is important to scientific study and to the health and sanity of man, that there be preserved some unique areas for scientists to observe nature's continuing evolution; for further generations to know historic landmarks as they were when history marked them; and for the dwellers to have resort to the grandeur and the peace of nature. Something will have gone out of us as a people if we ever let the remaining wilderness be destroyed; if we permit the last virgin forests to be turned into comic books and plastic cigarette cases; if we drive the few remaining members of the wild species into zoos or to extinction; if we pollute the last clear air and dirty the last clean streams and push our paved roads through the last of the silence, so that never again can we have the chance to see ourselves single, separate, vertical and individual in the world, part of the environment of trees and rocks and soil, brother to the other animals, part of the natural world and competent to belong in it. Without any remaining wilderness we are committed wholly, without chance for even momentary reflection and rest, to a headlong drive into our technological termite-life, the Brave New World of a completely man-controlled environment. We need wilderness preserved—as much of it as is still left, and as many kinds—because it was the challenge against which our character as a people was formed. The reminder and the reassurance that it is still there is good for our spiritual health even if we never once in ten years set foot in it. It is good for us when we are young, because of the incomparable sanity it can bring briefly, as a vacation and rest, into our insane lives. It is important to us when we are old simply because it is there—important, that is, simply as an idea. Even when I can't get to the back country, the thought of the colored deserts of southern Utah, or the reassurance that there are still stretches of prairie where the world can be instantaneously perceived as disk and bowl, and where the little but intensely important human being is exposed to the five directions and the thirty-six winds, is a positive consolation. The idea alone can sustain me....every loss is a little death in me. In us....These are some of the things that wilderness can do for us. That is the reason we need to put into effect, for its preservation, some other principle than the principles of exploitation or usefulness or even recreation. We simply need that wild country available to us, even if we never do more than drive to its edge and look in. For it can be a means of reassuring ourselves of our sanity as creatures, a part of the geography of hope. I have been called a pioneer. In my book a pioneer is a man who comes to virgin country, traps off the fur, kills off all the wild meat, cut down all trees, grazes off all the grass, plows the roots up and strings ten million miles of wire. A pioneer destroys things and calls it civilization. The curious world which we inhabit is more wonderful than it is convenient; more beautiful than it is useful; it is more to be admired than to be used. There is a love of wild nature in everybody, an ancient mother love ever showing itself whether recognized or not, and however covered by cares and duties. Climb the mountains and get their good tidings, nature's peace will flow into you as the sunshine flows into the trees. The winds will blow their freshness into you, and the storms, their energy, while cares will drop off like autumn leaves. Come to the woods, for here is rest. There is no repose like that of the green deep woods. Here grow the wall-flower and the violet. The squirrel will come and sit upon your knee, the logcock will wake you in the morning. Sleep in the forgetfulness of all ill. Of all the upness accessible to mortals, there is no upness comparable to the mountains. Only by going alone in silence, without luggage, can one truly get into the heart of the wilderness. All other travel is mere dust and hotels and baggage and chatter. How great are the advantages of solitude!—How sublime is the silence of nature's ever-active energies! There is something in the very name of wilderness, which charms the ear, and soothes the spirit of man. There is religion in it. The grandshow is eternal. It is always sunrise somewhere; the dew is never all dried at once; a shower is forever falling vapor is ever rising. Eternal sunrise, eternal sunset, eternal dawn and gloaming, on sea and continents and islands, each in its turn, as round the earth rolls. A venturesome minority will always be eager to set off on their own, and no obstacles should be placed in their path; let them take risks, for Godsake, let them get lost, sunburnt, stranded, downed, eaten by bears, buried alive under avalanches—that is the right and privilege of any free American. The mountains are fountains of men as well as rivers, of glaciers of fertile soil. The great poets, philosophers, prophets, able men whose thoughts and deeds have moved the world, have come down from the mountains—mountain dwellers who have grown strong there with the forest trees in Nature's workshops. Solitude is as needful to the imagination as society is as wholesome to the character. I find it wholesome to be alone the greater part of the time. To be in company, even with the best, is soon wearisome and dissipating. I love to be alone. I never found the companion that was so companionable as solitude.... A man thinking or working is always alone, let him be where he will. Solitude is not measured by the miles of space that intervenes between a man and his fellows. The esthetic values of wilderness areas much our inheritance as the veins of copper and gold in our hills and the forests in our mountains. When I shall be overthrown. Here the challenge, learn the lesson, pay the cost. Yet, was it not her right to search out a banded cup or tiger lily as inalienable as the right of stockmen to search out grass or the lumberman to claim a tree? Something hidden, go and find it. Lost and waiting for you. Go. Wilderness is not a luxury but a necessity, and as vital to our lives as water and good bread. A civilization which destroys what little remains of the wild, the sparse, the original, is cutting itself off from its origins and betraying the principle of civilization itself. alone in the midst of the earth! as they are the sole inhabitants of the land. alone in the midst of the land. Friends at home! I charge you to spare, preserve and cherish some portion of your primitive forests; for when these are cut away I apprehend they will not be easily replaced. From the forest and wildness comes the tonics and barks which brace mankind. In God's wildness lies the hope of the world—the great fresh, unblighted, unredeemed wildness. The galling harness of civilization drops off, and the wounds heal where we are aware. When we rally to preserve the remaining redwood forests or to protect the whooping crane, we are rallying to preserve ourselves, we are trying to keep in existence the organic variety, the whole span of natural resources upon which our own future development will be based. If we surrender this variety too easily in one place, we shall lose it everywhere; and we shall find ourselves enclosed in a technological vision without even the hope that sustains a prisoner in jail—that someday we may get out. Should organic variety disappear, there will be no "out." Wilderness is an anchor to windward. Knowing it is there, we can also know we are still a rich nation, tending to our resources as we should — not a people in despair search every last nook and cranny of our land for a board of lumber, a barrel of oil, a blade of grass, or a tank of water. We are not so poor that we have to spend our wilderness, or so rich that we can afford to. We dare not let the last wilderness on earth go by our own hand, and hope that technology will somehow get us a new wilderness or some remote planet, or that somehow we can save little samples of genes in bottles or on ice, isolated and manageable, or reduce the great vistas to long-lasting video-tape, destroying the originals to sustain the balance of trade and egos. David Brower, Not Man Apart, Nov. 1980, p 17. There are many people whose primary concern in the forest is the pursuit of beauty. The joy which such people derive from a sunset across some forest lake, from the boundless immensity of the panorama off some wilderness summit, from the unmarred splendor of a virgin forest, is not essentially different from that which other aesthete might derive from the paints of Rembrandt, from the sculpture of Rodin, from the music of Beethoven, or from the drama of Shakespeare. To argue that because lovers of the woods get some enjoyment from cut-over lands it is unnecessary to finance the retention of samples of the primeval would be as unconvincing as to argue that because lovers of music get some enjoyment from the concerts of mediocre pianists it is unnecessary to finance a Paderewski or a Rachmaninoff. Idaho is full of elk. Ohio isn't. The reason is obvious. The world we are told was made for man. A presumption that is totally unsupported by the facts. While progress should never come to a halt, there are many places it should never come to at all.